4 links pointing to Ourfinancialsecurity.org were found. Individual words like Reform, Americans, Financial and Vote are frequently used in text links from other websites. The most important links to the website are from Typepad.com and Marylandpirg.org. 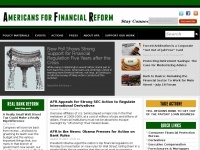 The homepage of Ourfinancialsecurity.org and the subsite /2014/06/afr-and-organizations-urge-members-of-congress-to-defend-the-cfpb/ are most referenced by other websites. The table shows the most important links to Ourfinancialsecurity.org. The table is sorted in descending order by importance. The table shows websites of Ourfinancialsecurity.org, which are often linked by other websites and therefore they are classified as important content. three profiles were found for Ourfinancialsecurity.org in social networks. Among other social networks the website is represented in Facebook, Twitter and Feedburner. The web server used by Ourfinancialsecurity.org is located in Culver City, USA and is run by Media Temple. The server runs exclusively the website Ourfinancialsecurity.org. The websites of Ourfinancialsecurity.org are served by a Apache web server using the operating system Unix/Linux (Unix). The software used to serve the webpages was created by using the programming language PHP. For managing the data of the webpages the CMS WordPress in the version 4.4.2 is used. XHTML 1.0 Transitional is used as markup language on the webpages. To analyze the visitors, the websites uses the analysis software Google Analytics. The website prohibits search engines and webcrawlers using the description of the website from the Open Directory project. Other actions by webcrawlers and bots are allowed.